Aviation exemplifies man’s desire to exceed limits, push past boundaries and blaze new trails–– contrails if you will. From two brothers whose flight in the first powered aircraft put Kitty Hawk North Carolina on the map, to U.S. Air Force test pilot Chuck Yeager breaking the sound barrier with a rocket- powered Bell X-1–– the allure of the skies has propelled mankind onwards and upwards. 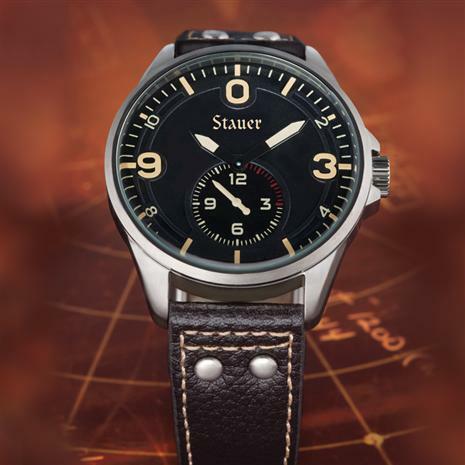 The Midnight Aviator pays homage to early aircraft and the brave souls who piloted them. The black dial reflects the altimeter on a dashboard of an aircraft, respecting aviation codes with large numbers and illuminated markers. A genuine leather band in bomber jacket brown sports cream stitching to match the oversized hour markers. Piloting an aircraft requires skill, finesse and impeccable timing. When mere seconds can make or break a landing, the timepiece of a pilot must be accurate within seconds. You can count on the Midnight Aviator to do just that with precision crystal movement that oscillates at an unbelievable 32,768 times per second, making time accurate to 0.2 seconds per day. And, while the pursuit of flight is a costly venture our business is grounded in keeping quality high and our prices low, which is why you can pay tribute to man’s innovative spirit for an equally innovative price.